Shelley dropped me off in Dunsmuir at 4:30 pm on a Sunday afternoon and I found a place to hang out just north of the depot. Not five minutes after I "set up camp", meaning leaning my pack up against a building and pulling out a bottle of White Port, I heard the whistle of an approaching southbound, and endeavored to repack everything with the utmost dispatch, which amounted to cramming the lot of my supplies into my pack with no regard for order or substance. To my utter delight the train ground to a halt with a gondola within easy reach - I lept aboard and found that my lading consisted of large steel slabs, each about 6" thick and about 4 or 5 feet wide and 10 to 12 feet long, with the top surfaces free of rust and slag. I immediately "set up camp", as it were, but this time taking the liberty to inflate my air mattress and spread out my sleeping bag, for it was indeed to be a relaxing and therapeutic trip down to Roseville. Leaving Dunsmuir at 4:45 pm I had a great trip down the canyon, waking up as we slowed down to enter the Roseville yard just before midnight. I packed my gear with satisfaction, knowing that I had survived another trip down "the Valley" and not died of boredom. After wandering aimlessly around the yard in the middle of the night, I found a nice clean boxcar to sleep in and did so until the next morning. Woke up with a song in my heart and a pain in my lower back, but had a good breakfast of coffee and a short stack at a restaurant in town. The usual plan was to meet Photo Bill today after he drove over from the City, and, knowing that it would probably be late this afternoon until he got here, I hung out at the Roseville Library. After dealing with their "Chain of Command" as to just where I was allowed to keep my backpack, I settled down to 6 hours of reading just about everything of interest the library had to offer, including a year's worth of the latest Trains magazines. Finally, blurry-eyed, I left the library at 4:00 pm, took a last cruise through Value Village, scammed some cardboard and a big piece of foam from their dumpster, and ended up meeting Bill in town at somewhere near the appointed hour. Around 9:00 pm we entered the yard and made our way through the steel catacombs, stumbling in the dark, splashing through puddles, until we realized that there weren't any rides on this train, but there was another train leaving in another hour or so a few tracks over, so we found a nice boxcar and sat in the doorway watching the almost-full moon and basking in the satisfaction of knowing that nobody knew where we were and fewer cared. Around 11:00 pm we were out of town and on our way over the Sierra. I remember waking up somewhere around Truckee with Bill furiously filming and enormous snowbanks on either side. I dragged myself out of bed just in time to see Donner Lake go floating by in a sea of fog, but retreated to my down cocoon for the rest of the way to Sparks. Although I seem to remember going through the yard around 8:00 am the next several hours were spent in serious sleep, gently rocking to and fro, passing the crew change at Carlin around 5:00 pm, where I figured I'd better get up and actually do something before it got dark. Watched Wells come and go at 6:45 pm (looking longingly at the aptly-named Sage Motel as storm clouds gathered) and, after staying awake as long as the scenery held out, I climbed back into my bag, and slept across the Great Salt Lake until arriving in Ogden at 11:45 pm. After a great sleep on our favorite loading dock behind some abandoned factory near the freightyard, we caught a bus into Salt Lake at about 8:15 am. At the transfer point in the center of town I bought some film and decided to pick up a few "supplies" before we hit the freightyard. I asked some guy where the nearest State Liquor Store was, and he cheerfully responded that it was at something like "200 South and 300 West", whatever in the heck that meant. After gaining a rudimentary knowledge of Salt Lake's whacked-out street numbering system, I realized that it was only about 4 blocks from where we were, but when I reached the corner of "200 blah blah and 300 blah blah" there was no liquor store in sight. I asked a passer-by, and was told to walk 3 blocks south and 1 block east, and I would find my liquor store. This I did in due course, but I was denied my bounty once again. After asking directions at a furniture store, I was told to walk yet another block north to the store. Feeling a bit giddy after my marathon hike, I staggered into the store and demanded to be shown to the "White Port Boutique". My seemingly innocent request was met with a stern look of satisfaction from the matronly Mormon lady as she announced, rather proudly, that "fortified wines" weren't allowed for sale in the state. Aghast, I stumbled back from the counter, my head reeling, my breath coming in short gasps... For the first few moments after hearing those dreadful tidings I must have looked like someone desperately in need of some stabilizing influence, because I vaguely remember the woman behind the counter seemed almost apologetic after seeing the effect that her declaration had on me. When I was finally able to speak, I think I said something like why did they sell whiskey but not strong wine, but my futile objections were now just bouncing off the woman's cold exterior, leaving me with no better bargaining platform than before. Resigned to my fate, I purchased a pint of JD and set off back to the bus stop, vowing never to convert to Mormonism nor take up residence in the state of Utah. With almost a complete tour of downtown Salt Lake under my belt thanks to some lame directions, I was looking forward to the train trip out into the desert. We took a bus (the 41 West Jordan, I believe) down to 3300 South, which is near the south end of the Rio Grande yard (the north end being near 2100 South - are you with me?) and walked a couple of blocks west to the yard, where we proceeded to walk in a northerly direction... ALLRIGHT ALREADY! 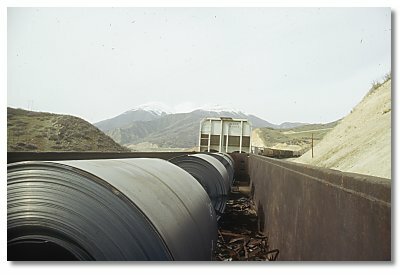 Anyway, no sooner had we set foot in the yard than a train started to pull out, and the engineer hollered out that he was going to Grand Junction so we piled aboard a gondola loaded with coils of steel and left the uptight Mormons in our wake. It was now 1:30 pm and we had a nice ride up to Soldier Summit, where, at 5:30 pm it was getting cold with snow and frozen-over ponds along side the tracks. We hunkered down for the long haul across the desert and except for brief periods of sightseeing, we whiled away the time reading and drinking. After having had enough of both activities I dozed off, waking up as we came into Grand Junction at 10:30 pm. Our train sped down to the receiving yard and broke up, while Bill and I said our good-byes - he walked back to the departure yard and caught a train on to Pueblo before sunup, then rode the rear unit of a coal train into Ft. Worth and hitched into Dallas. I saw a westbound empty lumber train on the main and beat feet for a boxcar. After hanging out for a few hours we left town headed back to Salt Lake at 12:30 am. It was a good thing that I was able to get so much sleep on the ride out because I sure didn't get much on the way back, thanks to a boxcar that "hunted" and otherwise rocked and rolled like there was no tomorrow. I was beginning to believe it myself when we mercifully started up the east side of Soldier Summit and the resulting curves pretty well quieted down the beating I was taking. I was finally able to enjoy a few hours sleep before we pulled into Salt Lake at 11:00 am. Now merely reversing my route, I caught the bus up to downtown, transferred to the #70-Ogden bus, and had a cheap (75 cents) but boring ride up to Ogden, where I plopped myself down in the jungle on the banks of a now-robust Ogden River at 2:30 pm. 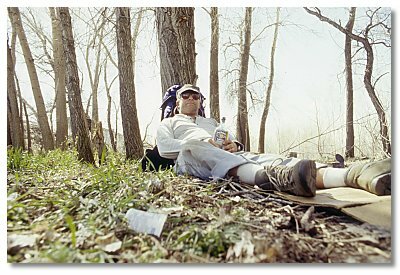 The afternoon was filled with activities ranging from washing up in the river to drinking in the shade of cottonwood trees, with gaps in the "action" filled in with re-arranging my gear, taking pictures and drinking in the shade of that cottonwood tree. After several hours of this blissful existence, the very second I decided to roll out my bag and take a real nap I heard the sound of an approaching train, and, after furiously cramming everything back in my pack, I grabbed another boxcar, but first making sure that it wasn't the same one I'd ridden into Salt Lake. It was now 8:00 pm, but my train had quite a bit of work to do before it left, so, not wanting to lose track of my car in the dark freightyard as the switch engines played a kind of "shell game" back and forth, I opted to stay in the boxcar while the train was switched, which assured me of not losing track of my car and being left behind, but didn't do much for my already overworked senses, as I caromed around wildly as the train was pushed and pulled around the yard. To my sheer delight we finally pulled out toward Nevada and home at 11:30 pm. Even though the boxcar I was riding in now was a flying carpet compared to the last one, I still found myself flinching every time it made the slightest jiggle, so "gun-shy" I was after the night before. I woke up more or less refreshed after having spent half a day in my bag. It was now 11:30 am and we were crossing a now snow-covered desert just west of Winnemucca. Fearing that if I stayed in my bag any longer I wouldn't be able to sleep tonight when I needed to, I reluctantly arose and stared blankly at the sand and sage roaring by outside my "picture window". At 3:15 pm we got into Sparks, with patches of blue sky but snow flurries from the rest. As luck would have it, my boxcar was only open on one side, and naturally it faced the freight office with no other freight cars in between, so as my train sat the remainder of the afternoon and into the evening in the Sparks yard, so did I, unable to leave for fear of being seen. When at last it was dark enough to have left the boxcar and sped to a store for supplies, the new crew came on duty, and at 9:30 pm we started up the east side of the Sierra. I watched the snow, etc. for as long as I could before it got too cold, then settled in for a great sleep. Bailing out as we came into Roseville at 5:00 am, I wandered around for awhile, then found a nice, clean boxcar to sleep in until 8:00 am. Tried to stay in my bag longer but felt I was developing bedsores from what must be some sort of a train-riding record for sleeping. Had my usual breakfast at Denny's, rounded up supplies (including any that weren't "available" in Utah) and hit the yard to wait. Luck was with me this time as there was a train called (two in fact) very shortly going north, and at 11:00 am I was out of town on the back of a grainer. Switched to a boxcar when we stopped at the first siding north of Roseville and slept 'till Redding, where with a sudden influx of euphoria from being on "home rails" again, I actually stayed awake on a delightful ride up the Canyon, getting into Dunsmuir at 7:00 pm. I called Shelley from the first phone I passed and we met at the Nutglade, where, ignoring the late hour, I enjoyed a cup of their great coffee. Even with the caffeine jolt, after 2450 miles I slept like a log that night.